A few weeks ago Paper-Garden.ca invited me to participate in their Canada Day Cards event and sent me a wonderful sampler pack of some of their red and white papers. - they came in Cover Weight (which is a medium weight cardstock), 105lb cover weight (a heavy cardstock) and Text Weight (which is a light weight cardstock). - A few of the samples are Metallics! with a light sparkly sheen to the paper. - My only complaint about the paper is the Metallics do not hold ink well. I tried stamping in both Dye and Pigment inks and both took a considerable length of time to dry. I checked the dye ink over a few days and it took at least two for it to be dry and touchable without smudging. Being a "stamper" this is a bit of a concern for me but not a huge problem as I just have to be prepared to put my stamped pieces aside of a few days. 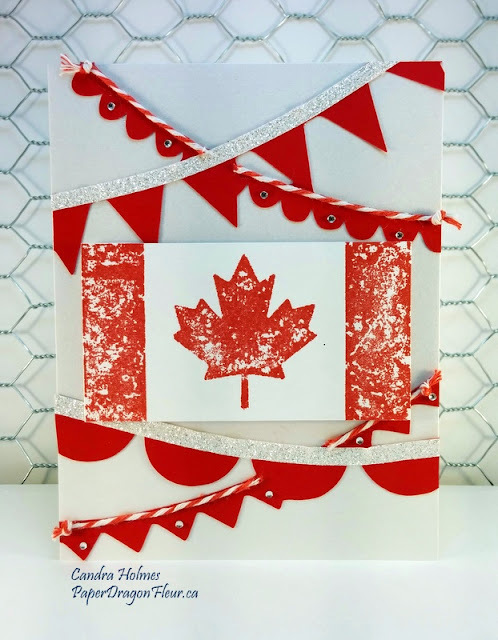 Using Pop-Tone Wild Cherry and Stardream Crystal paper I came up with this quick Canada Day Card. The stamps are from the Vintage Canada (retired) Stamp Set from Close to My Heart and I stamped on White Daisy Paper (CTMH) using Cranberry Ink. The little background banners are from the Cricut Artfully Sent Collection from Close To My Heart, they are part of a bigger card that I trimmed out for this project. A bit of Cranberry Twine, White Shimmer Trim and a few bitty sparkles (Close To My Heart) and my Happy Canada card is done. I hope you like my card and please find below other entrants into the Canada Day Card Challenge! I noticed the same thing about the inks on the metallic papers…but I did use staz on and that worked fine.